When an enemy comes against us, it either kills us or makes us stronger. A friend should uphold us and support us. However, the most powerful enemy is apathy. Apathy hides among our friends so we cannot destroy it without hurting our friends. When a powerful enemy comes against us and we need help to combat it, apathy among our friends helps it to destroy us. When we are lying on the ground and being kicked, our enemy may have mercy and let us live, but apathy has no mercy. When we cry out for help, apathy tries to reassure us that we just need to try a little harder and we can make it on our own. Later, when we die, apathy will say, “I had no idea that he was in trouble.” The apathetic person will not respond to danger until he himself is endangered. Too those who are living in countries were peace is difficult to find, my heart goes out to you and I wish there was something I could do, but you see I face a greater enemy here in Canada. If apathy could be defeated we could help you. Although many people from all over the world read this blog I get few comments. It would give me great pleasure it the comments on this post would come fast and hard to prove I am wrong. If apathy does not have you in her clutches, click on comments below and tell me what you are doing to promote world peace. I would love to hear from you and I will greatly relieved if my fears can be proven wrong. World peace is about mutual respect. Unity in diversity is the catch phrase. The human body has many different parts which function together as a whole. When a body part is severed from the body, it dies. If an essential organ ceases to function, the whole body dies. If any part of the body is injured, the whole body suffers. If we think about the body of humanity in that way, we can see, although different body parts carry out different functions, the health of the body is determined by how well those parts work together. It seems everyone wants to be the brains of humanity, but if a heart where to become a brain, a body with two brains and no heart would die. Although the body can live without some parts, it becomes a cripple if it is missing a leg or arm, for example. In fact, the pain of the little finger is felt by the whole body. If there is pain in any part of the body of mankind, we all suffer as a result. When there is mutual respect, we will respect all regardless of function. If the brain is to think it is more important than the fingers, then it should try picking something up without their aid. An act as simple as picking up a piece of garbage requires the co-operation on many parts of the body. Thus when all humanity works together towards the betterment of society as a whole, we have world peace and the body of mankind progresses to levels never before imagined. In my book The Alternative, I show how the development of the Southern states was delayed by the use of slavery. Because the African Americans were denied an education and forced into slavery, they were not able to contribute to the society in which they lived, and therefore the whole society suffered. Although slavery has been outlawed, the mentality around slavery has not yet vanished. Slavery was an ultimate example of exploitation of the work force, but those in the working class are still being exploited. There needs to be mutual respect between workers and management for the system to work efficiently. No individual human should be degraded or thought of as unimportant. We all need to work in the field we are called to work in. Children need to find out early what their calling is. I was 62 years old before I realized I was called to be an author. I wasted a lot of time pursuing other interests and I will not likely be able to reach my full potential so late in life, however I have a lot of good years ahead of me and I will do my best. 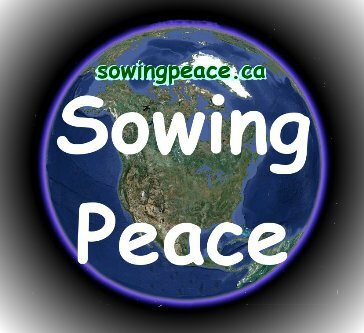 You can go to my Sowing Peace Web Site to follow my activities and find links to my blogs. I would love to hear your opinions and will respect your right to express them even if I cannot agree. I am also sure that we can find some level of agreement if we look for it. In reviewing my stats I am discovering an interesting trend. Not surprisingly most viewers are from the USA. Since the USA has the highest population of English speaking citizens, this is not surprising. However, finding France as the next highest with 2368 views is more surprising. Both the Ukraine and Poland have broken the 1,000 mark with Russia and China close behind. What I find most surprising is that Canada is in seventh place and that is mostly due to early visits when I first started my blog and was more actively promoting it to my friends. When we look at views over the last 30 days, Canada does not make the top 10. South Korea has an equal number to the USA and again we see we have gotten attention from our good friends in Poland and Ukraine. This seems to indicate that a lot of other countries are much more concerned about world peace than Canadians are. The fact that I have been sidetracked by other projects may mean that I am just as guilty. Having gotten involved in the FugitiveSlave Chapel Preservation Project , I have not been putting as much effort into this blog, however I have found that we are getting a lot of local support for the Fugitive Slave Chapel. We are busy attempting to save and old Chapel that was built around 1848 by Fugitive Slaves and others. Those living in other parts of the world may not consider that old, but Canada had not even become a country yet when this structure was built, so to us it is older than our country. Thus it seems that Canadians are much more interested in saving Historic Buildings than in promoting world peace. However; I must defend my involvement in this project. The Fugitive Slave Chapel represents a history of an oppressed people and an era were change was happening. It represents a recognition of Black People as being equal citizens which is an important part of world peace, and it is for this reason that I felt this project worthy of my time. Although I am sad about the reluctance of Canadians to get involved in world peace I am very happy about the international attention and would love to work with organizations in other parts of the world. It could be that the relative peace we enjoy in Canada makes us less active in promoting peace but it is my view that if any part of the body of mankind is hurting, the whole body suffers. I have heard the saying that the pain of the little finger is felt by the whole body, and I liken the body of humanity to be like a human body. Thus, when you are hurting, I feel your pain. This is what drives me to attempt to heal the world. 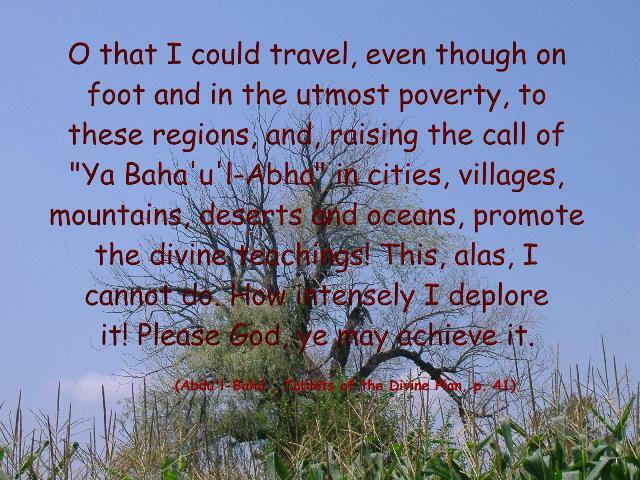 I have pledged myself to live at peace with all I come in contact with and I am aware of the challenges in doing this. I have met with people filled with hate and I can’t count the number of times I have had to defend those who are seen as wishing me ill. The fact is that we are all individuals and, should your country declare war with my country, it is unfair for me to lump you in with your countrymen as being an enemy of peace. In fact, if you are a peaceful member of a warring country, I need to reach out to you and strengthen you so that the leaven of peace will grow and transform your country. As it appears every country has hateful and warring elements, we need to nurture and support this leaven of peace so the world can be transformed. If we meet hatred with hatred then hatred will win. When hatred is met with love, hatred is dissolved and transformed and love will win. It is like the difference between darkness and light. If we view hatred as darkness and love as light we will soon realize that darkness is dispelled when a light is turned on. You can never go into a room filled with light and turn on a dark but as soon as you turn on a light in a dark room, darkness has lost its power. So the power is in love and hatred is only the absence of love. God created us as social animals that are designed to help one another. When we don’t fulfill that purpose we become bitter and hateful. It may take a loving person to reach out to such a soul to shine the light of love on it in order for it to see its purpose, but many times the person discovers on his own that he can best help himself by helping others. In my efforts I continue to reach out the best way I can. Since I know html I create web sites in my efforts to promote peace. You can go the my Sowing PeacePage for an example. This blog was started to attempt to get a dialog of peace going and I appreciate comments and feedback on my posts. If someone is interested, a can also add you to my blog and allow you to make posts. I would want to see a couple of your posts first to be sure they are suitable so you can email your ideas first, and when I feel you are ready I will add you as a blogger.